24 Hour Time Clock - Real Time Clock, Reference, Uses, Conversion and More! The 24 Hour Clock is the most common way of telling time in the world. 24 hour time is mainly used in Asia, Africa, Europe, and the Latin American countries. It’s the most preferred way of communicating time to other people all around the globe. It doesn’t use “a.m” or “p.m”. 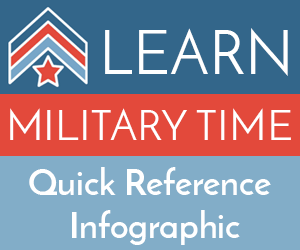 In the US and some of the English-speaking countries in Canada, the 24 hour clock system is referred to as military time. In the UK, this system is at times referred to as continental time. In other parts of the globe, it’s referred to as railway time. The international standard time notation (that is, ISO 8601) is also based on this 24 hour clock format. *This real time 24 hour time clock uses the time information on your device to determine the current time. The 24 hour clock is a convention of keeping time where the day typically runs from midnight – midnight and it’s divided into twenty-four hours. The clock starts at 00:00 (that is, midnight) and it indicates the hours that have passed since then (that is, from 0 to 24). Time in the 24 hour time format is normally written in form of hours:minutes (for instance, 09:33), or hours:minutes:seconds (09:33:24). Numbers that are under 10 have a 0 in front (which is known as the leading zero); for example, 08:02 (8:02 AM). Under the 24 hour clock system, a day starts at midnight, (that is, 00:00), and the day’s last minute starts at 23:59:59 and then ends at 24:00:00, which is typically identical to 00:00 (of the next day). Midnight is shown by 24:00 and it means the end of the day. 00:00 means the day has begun. For instance, one can say, “Monday at 24:00” and “Tuesday at 00:00” which basically means the same exact time. That being so, the United States military usually prefers not saying 24:00; they don’t like having 2 names for one same thing, thus they prefer saying “23:59”; which is 1 minute prior to midnight. When writing 24 hour time, the hour(s) is always two digits long, and so are the minutes and the seconds. A leading zero(s) can be added where necessary, to make every group have 2 digits, 00:08:00 for 12:08:00 a.m. A day basically starts with midnight; 00:00:00 (that is, 12:00:00 a.m) and then ends at 1 second prior to the following midnight; 23:59:59 (that is, 11:59:59 p.m). 1 second later is 00:00:00 which means a brand new day has started. Some clubs and stores which normally close at midnight may use the notation 09:00 to 24:00 to mean that they’re open from 9 a.m til 12 midnight. The 24 hour clock display format is usually hh:mm:ss, where the ‘hh’ represents a 2 digit hour, the ‘:’ is the colon that’s used as the separator, the ‘mm’ is a 2 digit minute, while the ‘ss’ is a 2 digit second. In case the seconds aren’t used, the separator that’s after the minutes will not be used. Another less common method used, is omitting the colon, and instead, adding the word ‘hrs’ after the number(s); as in, hhmm hrs (like 2147 hrs). This is actually a military method. Nowadays, all the modern computers have the capability of displaying time in the 24 hour time format. Most digital devices such as cell phones, digital clocks and wristwatches, usually have a setting where one can change between the 12 hour time and the 24 hour time. 24 hour clock time is normally used in the military, transport, in computers, in public safety, among many other areas. In many European, Asian, and Latin American countries, most people normally use the 24 hour clock to write time. Many Italian, French, Romanian and German people use the 24 hour clock when speaking. The 24 hour clock system is also commonly used in many timetables. The start of the 24 hour time period is actually rooted in the Early Egyptian Culture. Some other time keeping methods and systems were used prior to the 24 hour time period. The Egyptians were the 1st people to use 24 hour clock system. Their system basically revolved around the actual time it took certain constellations to pass across the sky, eventually leading to the rise of the 360 day year. As a matter of fact, there are numerous surviving examples of many clocks that were built using 24 hour clock system, some of which include; the famous Orloj located in Prague, and Shepherd gate clock which is at Greenwich. Italy was the earliest country to ever introduce the 24 hour clock system nationally, back in the year 1893. The other European and Asian countries followed later on: France adopted the system in the year 1912, followed by Denmark in the year 1916, and then Greece in the year 1917. By the year 1920, Switzerland, Spain, Portugal and Belgium had all switched, then followed by Turkey in the year 1925, and Germany in the year 1927. By the late 1920s, many Latin America countries had also adopted this 24 hour clock system. It has less confusion between evening and morning; for instance, 7 o’clock is indicated by 19:00 to mean evening. You don’t have to try figuring out if noon time is 12 p.m or 12 a.m.
It’s easier to calculate the duration. (for example, from 11:40 a.m to 6:40 p.m is 7 hours, but 11:40 to 18:40 indicates the 7-hour difference much better).